Summary: Better engagement with Europe’s de facto states by international actors within a framework of nonrecognition should benefit all sides, yet it remains a big challenge. For decades, three “de facto states”—Abkhazia, Transdniestria, and northern Cyprus—have endured in Europe. They are unrecognized internationally but are relatively stable and unlikely to collapse. The conflicts associated with them remain unresolved. Better engagement with these breakaway territories by international actors within a framework of nonrecognition should benefit all sides, yet it remains a big challenge. 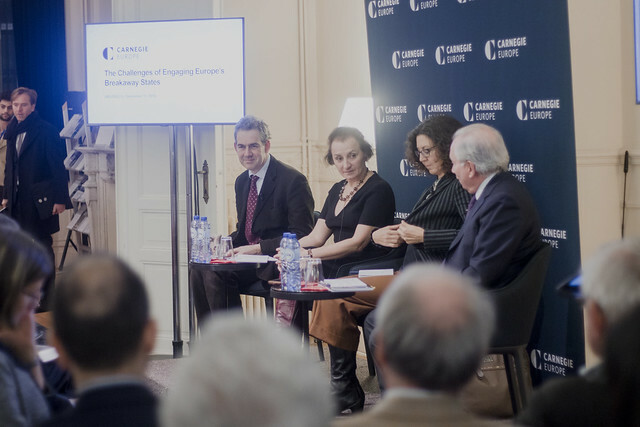 Carnegie’s Thomas de Waal discussed his comprehensive report, Uncertain Ground: Engaging With Europe’s De Facto States and Breakaway Territories, putting forward new ideas for policymakers in these conflict regions. Rebecca Bryant, Natalia Mirimanova, and Marc Pierini joined De Waal in a conversation about Abkhazia, Transdniestria, and Cyprus; the EU’s role in these territories; and what lessons their experience has for the still-developing conflict in eastern Ukraine. Copies of the report were available at the event, and a light reception followed. Rebecca Bryant is a professor of Cultural Anthropology at Utrecht University. Her research focuses on ethnic conflict and displacement, border practices, post-conflict reconciliation, and contested sovereignty on both sides of the Cyprus Green Line, as well as in Greece and Turkey. Thomas de Waal is a senior fellow at Carnegie Europe, where he specializes in Eastern Europe and the Caucasus region. Follow him on Twitter @Tom_deWaal. Natalia Mirimanova is a conflict resolution scholar-practitioner with over twenty-five years of experience in the South Caucasus, Central Asia, Russia, Moldova, Ukraine, Western Balkans, Eastern Europe, and Cyprus.